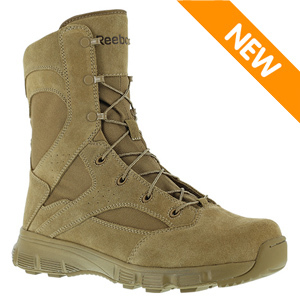 The Reebok Dauntless series was made for soldiers on the go. Designed with weight and agility in mind, this boot is suited for activity where stealth and precision are required. It's comfort features include a moisture wicking mesh and shock absorbing EVA dual density midsole to help you fight fatigue during the day. The Reebok RB8822 Men's Dauntless OCP ACU Coyote Brown Tactical Boot was designed specifically for the U.S. Army's new OCP uniform and is compliant with AR-670-1.